Priene: Priene is an ancient Hellenistic city located just to the north of Miletus in western Turkey. It was an ancient Greek holy city and the home of an important temple of Athena. Priene’s picturesque ruins include several columns of the Temple of Athena, much of the city wall, a well-preserved theatre and a council chamber. Priene was laid out in an orderly grid plan, unlike the more sprawling arrangement of most ancient cities. Six main streets run east-west and 15 streets cross at right angles, all evenly spaced. The town was thus divided into about 80 blocks, or insulae, each averaging 46m by 34m. Other ruins at Priene include the well-preserved seating and altar of the 2nd century BC Bouleuterion (city council chamber, which could hold 650 people), more temples, the stadium (2nd century BC; 190m long) and a Upper and Lower Gymnasium. Priene: The ancient harbour city of Priene probably changed its location when the silt of the Meander River threatened to bury it. Now it is nearly 16km from the sea. The original place of the city has never been found but it was probably a peninsula with two harbours. Priene was laid out on a Hippodamian system of grid plan at the foot of a spectacular cliff on Mount Mycale, and contained many famous examples of Hellenistic art and architecture. All the streets intersect at right angles. Remaining small with about 4,000 or 5,000 inhabitants and never of great political significance, it shared the same history as the other Ionian cities. 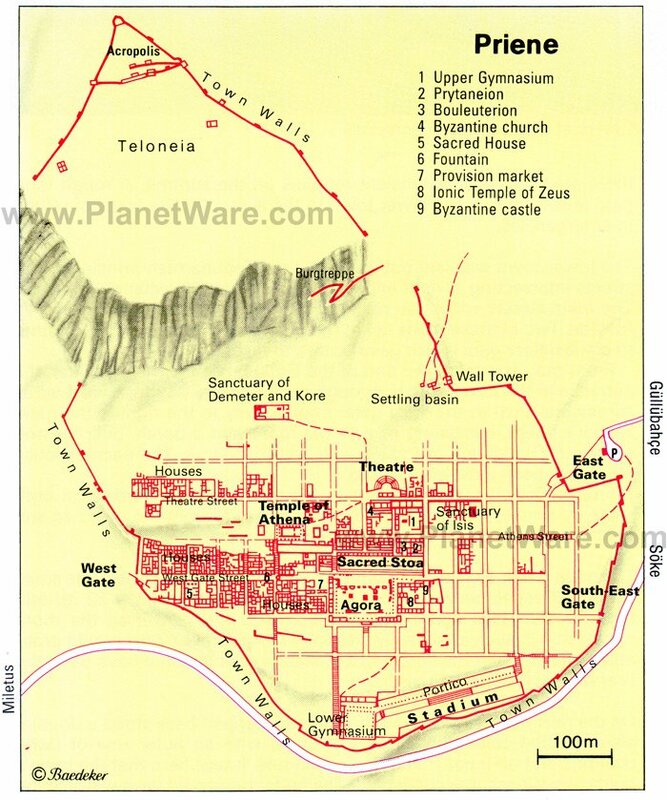 The city was organized in four districts: the religious (Athena Temple), the political (Bouleterion and Prytaneion), the cultural (Theatre) and the commercial (Agora). In addition to the Athena Temple, the people of Priene built shrines dedicated to Zeus, Demeter and Egyptian gods. From the information board at the site: In many ancient cities, the Buleuterion (an assembly hall, mainly used by the city council) and the Prytaneion (the offices of the main magistrates, the prytanes) were close to each other. The Buleuterion (built about 200BC) was almost square, and could accommodate some 500 people. The length of the roof beams seems to have caused problems, and later they had to be supported by pillars set on the seats. The central altar with the busts of gods carved in relief, as well as the seats in the external alcove on the south side and further to the north belong to later building phases. The Prytaneion was, among other things, where the sacred fire was kept, and was used to entertain official guests and honorary citizens. The visible remains are laid out like a courtyard house, and date to the Roman imperial period. Priene: The Temple of Athena Polias was rebuilt in 334 BC as a gift from Alexander the Great and was a standard Ionic structure with eleven columns along its sides, six at the ends and two in antis. Athena Polias was the goddess of Priene and protectress of the city. The proportions of this temple were taken as a classical model or pattern by the Roman architect Vitruvius. The architect of the Athena Temple was Pytheos who also built the Mausoleum at Halicarnassus, one of the Seven Wonders of the ancient world. Halikarnassus was part of the kingdom of Pergamon. The theatre in Priene: The Theatre is a 4 or 3C BC building and one of the finest extant theatres of the Hellenistic time. Although it was rebuilt in the Roman period, it still remains as typically Hellenistic as the city of Priene itself. The theatre was carved into the hillside and held a capacity of 5,000 people. Five marble seats with arms were provided for priests and dignitaries. In the middle of the prohedria there was an altar which was sacred to Dionysus. Performances used to start with sacrificial rites. The proskene is well-preserved and consists of a colonnade supported with 12 Doric half-columns. The skene had an upper floor which no longer stands. From the information board at the site: The largest church in the city was a three-aisled basilica with an entry hall at the west end, a pulpit with two staircases in the centre, and an apse with seating steps for the clergy in the East. The chancel in front of it was separated by a screen, and the apse was set into the main structure of the Roman baths. The Basilica has a skewed plan, and most of it was built of stone re-used from older buildings. The surviving west staircase of the ambo and the ornamental chancel-screen are early Byzantine works. The church was abandoned around 1300AD. Bias of Priene: Bias, the son of Teutamus, was a Greek philosopher. Satyrus puts him as the wisest of all the Seven Sages of Greece. • All men are wicked. • Do not speak fast, for that shows folly. • Do not praise an undeserving man because of his wealth. Bias of Priene: Bias is considered to be one of world’s seven most important philosophers, who lived in Priene around 600 BC. Plutarch tells the story of how the King of Egypt consulted the great thinker as to which evil should be removed from an unhappy man in order that he should be cured of his misery. “His tongue,” was the reply. The 6th century BC was the most prosperous era for Priene, as for all other lonian cities. This brilliant era ended in 545 BC when Mazares, the commander of the Persian king Cyrus, attacked the city, burnt it down completely, and enslaved its people.